Description of Patellar Luxation. The definition of Patellar Luxation originates from the Latin word luxare meaning to dislocate. The dislocation can relate to any part of the body such as a bone at a joint or even in the eye lens. The two most common problems relating to dogs are Patellar Luxation where the patella, or kneecap, luxates, or pops out of place and Lens Luxation where the eye lens luxates, or pops out of place. The Patellar, or kneecap, is a thick flat, triangular, movable bone that forms the anterior point of the knee and protects the front of the joint. When you are worried about your pet dogs or puppies it is wise to make general observations and a note of your dog's general well-being before considering a health issue and problem such as Patellar Luxation. Overall physical condition? Mental attitude? Appetite? Condition of bowels and urinary apparatus? The nose of healthy dogs or puppies is moist and cool but in sick dogs it is usually hot and dry. Hair loss? Dry skin? Discharges? These general observations are useful to consider whilst checking out the symptoms of Patellar Luxation. Grade 1 - Medial luxation occursin toy, miniature, and large breeds. Grade 2 - Lateral luxation occurs in toy and miniature breeds. Grade 3 - Lateral luxation occurs in large and giant breeds. Grade 4 - Trauma induced luxation occurring in various breeds. Grades one, two and three for Medial or Lateral Luxation are believed to be inherited and are also are unfortunately suspected of being inheritable. Canine Patellar Luxation treatment - Diagnosic tests to confirm a diagnosis will be required. 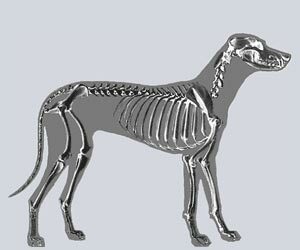 X-rays and in some cases MRI tests will be carried out by your veterinary surgeon as well as a physical examination. Canine Patellar Luxation treatment - The treatment of Patellar Luxation is surgery and involves replacing the kneecap back into the groove, which prevents it from popping in and out. Pet Insurance for Patellar Luxation. Remember canine insurance / pet dogs health insurance for treatment of health and medical problems such as Patellar Luxation. Unexpected visits to the vet and veterinary treatments for your dogs and puppies due to illnesses such as Patellar Luxation can quickly add up so get quotes for canine health / pet insurance coverage for treatment due to accidents, treatment of illnesses, prescriptions, surgeries and possible hospitalization treatment for your dogs or puppy. Get the best deals for pet insurance from pet insurance comparison websites - make sure you get the best rates for canine health insurance to cover visits to the Vet for the diagnosis and treatment of unexpected ailments such as Patellar Luxation. The sole purpose of the Patellar Luxation section on the Dog Symptoms and Canine Health website is to act as a reference guide to provide useful information to the owners of dogs and puppies. This article on Patellar Luxation is not intended to be used to diagnose or treat sick dogs or as a substitute for obtaining professional veterinary advice. Please remember that if you are in any doubt about your Dog's Health, or problems associated with Patellar Luxation, please consult your Canine Veterinary Specialist immediately for professional treatment. Your vet will diagnose whether Patellar Luxation is the problem and prescribe appropriate medication and treatment.